I enjoy reading information that reflects the approach to physical fitness to that of the early days. As far back as Revolutionary times I’ve read how men (no offense ladies, but I am referring to yester-year at the moment) would encourage getting outdoors (regardless of the time of year) and doing tasks that promoted physical vigor. Chopping wood, hauling buckets of water, hunting, hiking, climbing and the like created physicality all too unfamiliar in today’s world. Today’s high-tech, glamorized training world promotes fitness as a means unto itself and doesn’t look at the big picture. And let’s face it, these activities can still be done today but are hardly taken advantage of. I look at training as a way of promoting both men and women’s strength and fitness so they can experience good health, become more functional in life, allow for more re-creation and appreciate and enjoy the opportunity for physical vigor. Are you Struggling With Your Aerobic Training? I am a firm believer that aerobic exercise is a vital component to an overall fitness program. How one goes about achieving aerobic health is certainly a personal preference and therefore the following information is for example only. For those who find it mentally laborious to perform stationary aerobic activities; i.e. the elliptical, stair climber, treadmill, etc. for any length of time but want to reap the benefits of its inclusion, the suggestions below may be of value to you. If you are one of those folks who would prefer to watch paint dry then to sit on a bike to nowhere, here are just a couple of simple options to makes aerobic exercise more tolerable. Your goal for the day is to perform 30 minutes of aerobic training. 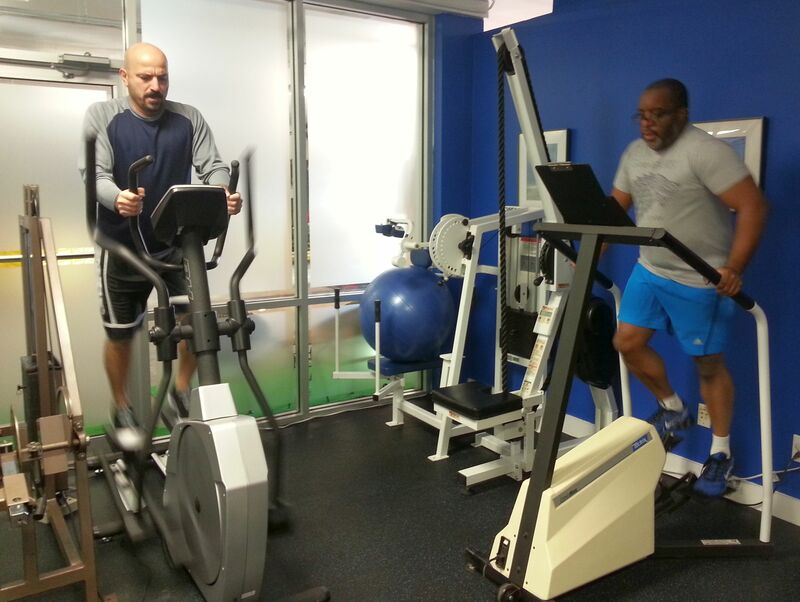 You have access to 3 pieces of equipment: the elliptical, the stair climber and the treadmill. Perform 5 minutes on each piece of exercise equipment for 2 rounds, taking as little rest as needed to start the next exercise up. Another 30-minute example is again taking 3 pieces of equipment and doing 4 rounds. Round 1 for 4 minutes, round 2 for 3 minutes, round 3 for 2 minutes and round 4 for 1 minute. You may find the idea of switching equipment tedious at first but the exchange of exercises allows for a greater focus on the exercise and a higher output of energy, plus the stopping-starting creates a bit of interval application at less intense levels and really offers a greater “kick” to the session.